Smiley is entering into a partnership with fashion brand I.T. CHOCOOLATE on a new apparel and accessories collection. Launching on August 15th across 20 :CHOCOOLATE stores in Hong Kong and Macao, the range will also launch in :CHOCOOLATE stores across China, Taiwan, Singapore and Canada later this month. Featuring a colour palette of black, white and grey, with colour pops of yellow, sweaters, t-shirts and leggings all include the iconic Smiley logo in graphic prints. The range is aimed at adults and kids who want to add happy, fun and casual pieces to their wardrobes. Accessories such as bags, caps and towels all complement the range and complete the look. Prices range from HK$99 – HK$279. To celebrate the launch, :CHOCOOLATE will be holding in-store promotions and giveaways, including a free towel for customers when spending over HK$600. Launched in 2006, :CHOCOOLATE is a brand that provides everyday’s wear with superior fit and great looks for individuals. It is tailored for the forward thinking group that have definite core values and position in life, updated from well-rounded exposure yet are down-to earth and unpretentious and appreciate the originality and quality in life. In Fall/Winter 2011, the brand expanded across the lifestyle category that focused on bringing a simple and tasteful living style to those who embrace minimalism. The Smiley face was forever immortalised as the iconic image of the acid house music movement in the 1980s. During this ground breaking time for global dance music and club culture the Smiley image was adopted by almost every clubber and raver globally and adorned every dance floor from London to Chicago. This was the beginning of a special relationship between house music and Smiley that has spanned over 25 years and remains as strong today as it was back in the day. 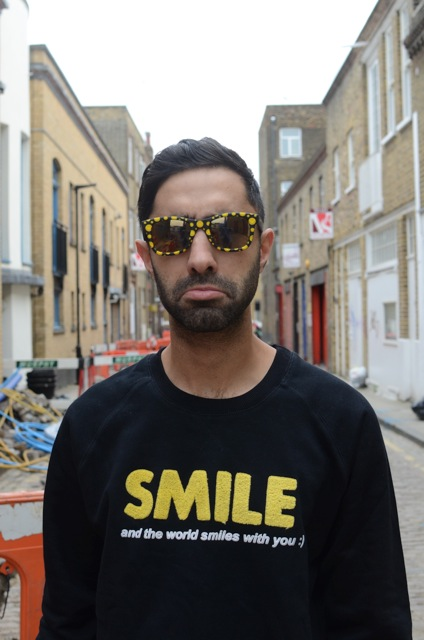 Smiley London pays homage to over two decades of UK dance music and DJ culture, a capsule collection dedicated to the electronic movement. For SS15 Smiley London launches a completely new interpretation of the Smiley face, with the entire collection consisting of monochrome styles and prints and an occasional trademark Smiley yellow colour pop. Sublimation prints feature heavily across men’s and women’s crew neck t-shirts and loose vests, while transitional hoodies & jumpers are emblazoned with bold slogans. Snap back caps make a return, as well as an introduction for this season of a premium sweatpant. Drawing influence from over two decades of block rocking beats, the unforgettable raves and the unique fashions that keep London at the forefront of street culture. Smiley ushers in the festival season in the Netherlands. Smiley had a headline slot at this years Dutch music festival ‘RetroPop’, which was played out this month in front of a sold out 10,000 raucous crowd. This 1980s heritage pop music festival featured a host of top names and was headlined by iconic band Simple Minds. All festival staff were resplendent in Smiley tee shirts and Smiley supplied bespoke artwork throughout the event site. Celebrate a Summer of Football with Smiley! With the biggest football tournament in the world almost upon us we want to spread the Smiley feel-good vibes and get people across the world involved in the beautiful game. SmileyWorld has teamed up with everyone’s favourite chocolate spread Nutella to produce a collectors edition glass pot featuring Smiley flags from some of the best national football teams in the world. To enter this competition simply register for our newsletter and we will draw at random 100 people to receive this limited edition 4 pot Nutella set. Why not download your favourite national teams flag as a screensaver or wallpaper? We are offering exclusive and FREE downloadable content direct to your computer or mobile phone that will ensure all your friends and family know exactly which flag you will be flying this summer. Everybody loves Brasil! Whether it’s the sunshine, carnival, beaches, samba rhythm or their football superstars you never need an excuse to wear the magical green, gold and blue.